Jewelry rolls are great way to store your jewelry when traveling. 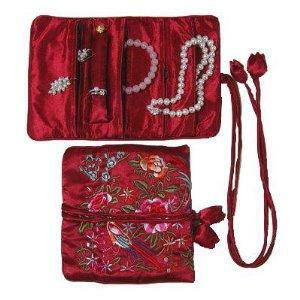 A roll for your jewelry can be tucked inside a bag without worrying if it will fit. If you've never used this kind of jewelry storage before, then you're in for a treat. This is one of the best ways to store jewelry without a jewelry case or box. It's also a great way to carry your jewelry with you. The jewelry roll closes by rolling upon itself. Depending on the style, the roll may come with self-ties that are often made out of ribbon. Other rolls may have a simple flap with a snap or hook and loop closure. A leather roll will usually have a metal closure, and some even come with a lock and a key. There is a wide range of material choices when it comes to this type of jewelry storage. Many of them are colorful with pleasing pattern designs. Cloth is usually the first choice of material for a jewelry roll, since it can be easily rolled up and tucked into a drawer, suitcase, purse, or even a coat pocket. This can be especially attractive if you're nervous about leaving your valuables in a suitcase to be loaded onto a plane or inside a hotel room that doesn't have its own safe. You can transport your jewelry to the hotel's main safe without the fear of anyone knowing that you're carrying anything of value. A cloth roll is convenient when you're limited in storage space, and it can be hidden between layers of clothing stacked in a drawer. Cotton is always a great choice of fabric because of its durability and ease of cleaning. You certainly will have a broader choice of colors and patterns when you go with cotton. You may want to buy a quilted roll to give extra cushioning for your jewelry. Embroidered fabric is perfect if you prefer something more whimsical. You can find this style in various patterns and themes. Select one with your favorite animal or perhaps a motif that symbolizes your avocation or occupation. Satin or silk may be a good option if the material is padded to protect your valuables and lined with a slip-free fabric to keep your jewelry from slipping out of the roll. There is the risk of a piece of jewelry snagging the fine weave of silk and satin fabrics. 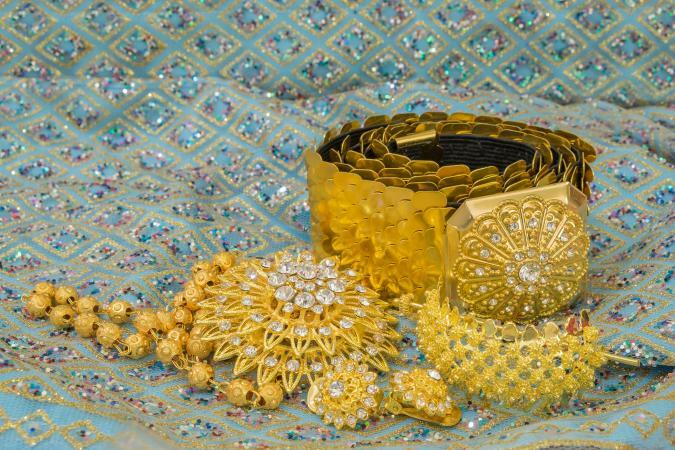 Whether or not this is a good choice for your needs will depend on the construction of the jewelry roll and the pieces of jewelry you need to store. Velvet can be a great option if you'd like a touch of elegance. Just about any kind of velvet can be used for this purpose. A crushed velvet material will travel well, since any wrinkles will be hidden in the fabric's natural appearance. Some velvet rolls have satin piping along the edges, giving them a finished look. Cloth isn't the only popular material for jewelry storage rolls. Many people prefer the luxurious feel of leather or the easy care of vinyl. Leather is probably one of the oldest material choices used for the protection of jewelry. Tooled leather can be soft and pliable. Some leathers have a purposefully stiffer finish to give greater support. One popular style of jewelry rolls looks like an oversized wallet complete with a zipper pouch, ring bar, and slotted envelope top. This roll is secured with a metal slot and bar that twists to lock. Other leather rolls come with straps and buckle closures. Vinyl is a cheaper and more economical choice over leather, and it's a great option for those who have ethical concerns about using leather. It's often difficult to distinguish between real and imitation leather. Jewelry rolls come with various features designed to secure your jewelry. Some rolls have more storage compartments than others. Some features may be better designed for your specific needs. You may want to test the hooks and snaps to get an idea how they will hold up under use. Another element to consider when examining roll features is whether or not your necklaces and chains will remain tangle-free during transport and everyday use. Earring stations are sections that are designed to keep your earrings organized. All you do is remove the back of your pierced earrings and insert the posts through the material slots. Many earring stations come with a snap-down flap for added protection. Some rolls come with hooks for securing your necklaces and bracelets, while others offer rings or snap closures. Pockets are very common and often have an elasticized top, zipper closure, or snap closure. A pocket is great for storing a larger piece of jewelry, and it is usually located at the bottom of the roll beneath the hook, ring, or snap section. This placement allows it to double as an additional way to secure longer necklaces and prevent them from getting tangled. Some pockets may be double-padded to give extra protection for your jewelry. A ring bar can also be a useful feature. The bar is usually made out of fabric-covered plastic that is secured on one end and opened by unclasping the other end. You simply slide your rings onto the bar and reattach the end. As you examine the travel storage options for your jewelry, be sure to consider what pieces of jewelry you will be carrying with you when you travel. There's sure to be an option that meets your needs and speaks to your sense of style.